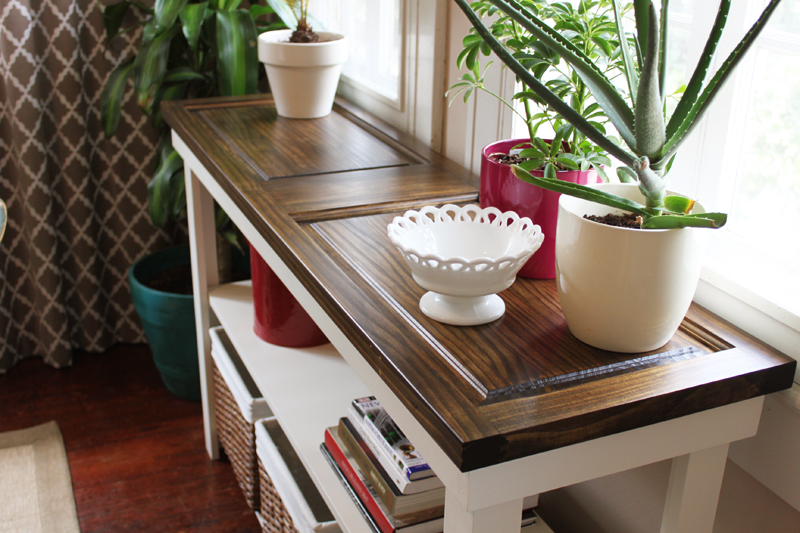 Or as we like to call it, our “foyer plant table.” Yes, the whole idea for this table came about because we needed a long, skinny table to go underneath the arched windows in our foyer to put several of our houseplants on. They weren’t getting enough light in other places in the house and these are the only windows in our house without window treatments on them. 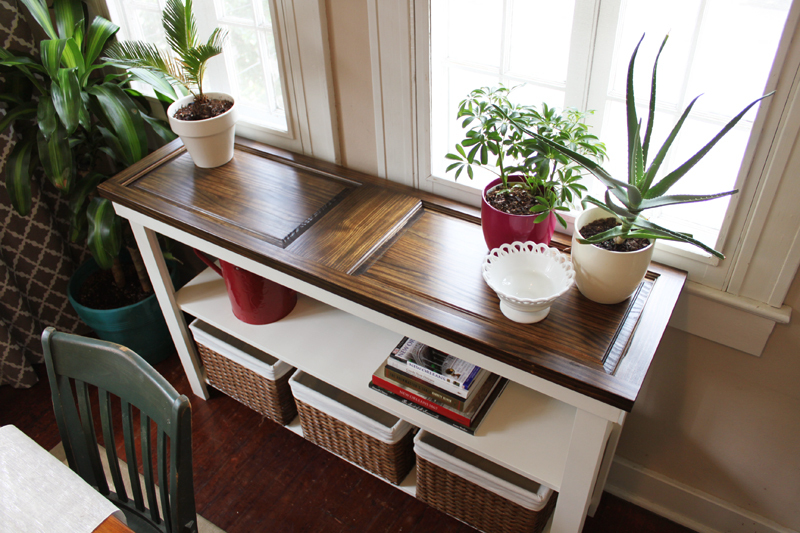 So we did indeed build an entire table for our plants (that would also provide much needed storage for Drew’s office and electronic equipment). I think it turned out pretty awesome. In fact, it might be my favorite home project we’ve done so far. My first thought was that we might be able to make the top out of old, long shutters. 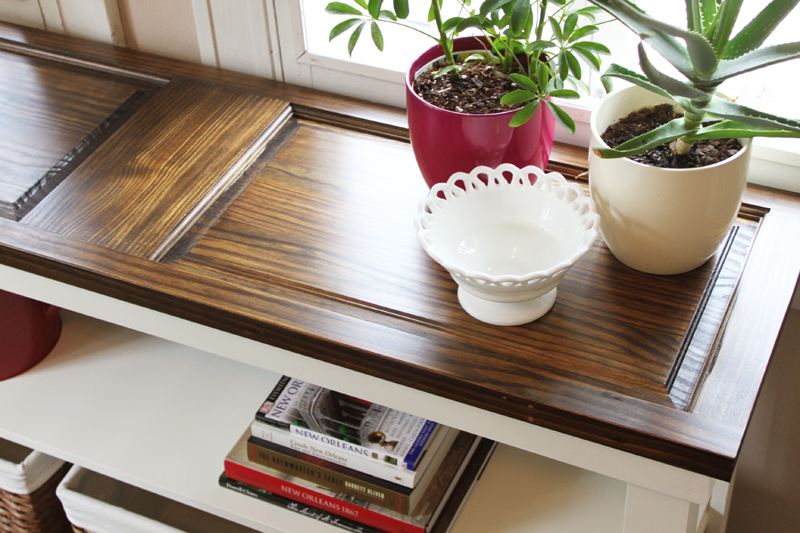 But thinking upon it further, we didn’t think that the slats in shutters would be a good idea to hold any weight for the top of a table. 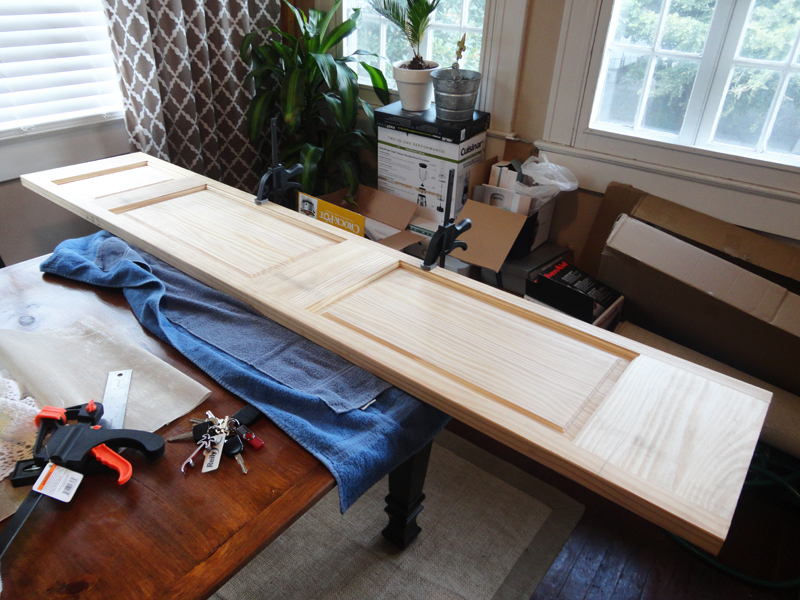 Since we just finished updating our old door headboard, we thought about using an old door or maybe cutting one in half to work for the skinny top. Then we remembered that many old buildings in New Orleans have two skinny doors that open instead of one big one, so we were hoping that just maybe, we might be able to find one of those old doors. It was in great shape. I don’t know what it might have been used for before, but there were no hardware holes and the wood was unfinished. It only had a few dings in it and was super dirty. 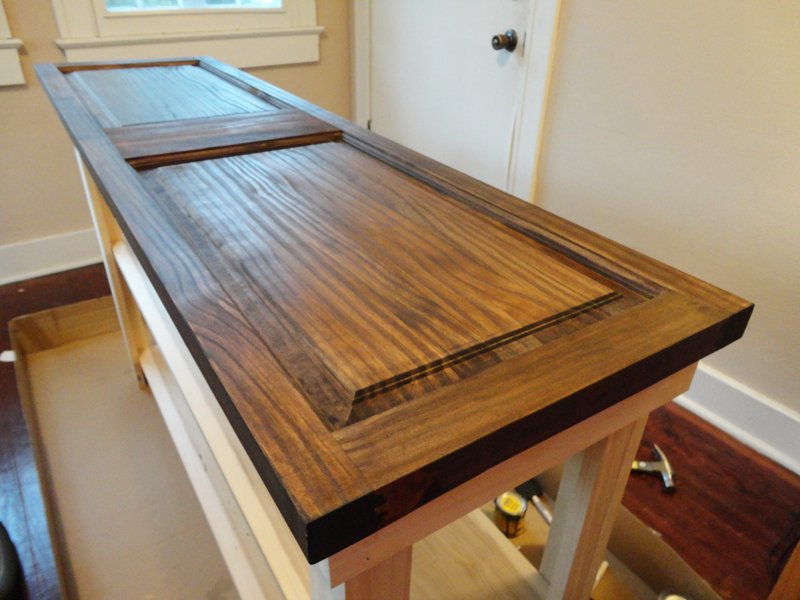 They did have several other options that were more rustic and had actually been used as doors, but we thought this wood was more of a blank canvas for our project. For $28 and an uncomfortable ride home (with 4 people in the car with it), she was ours. 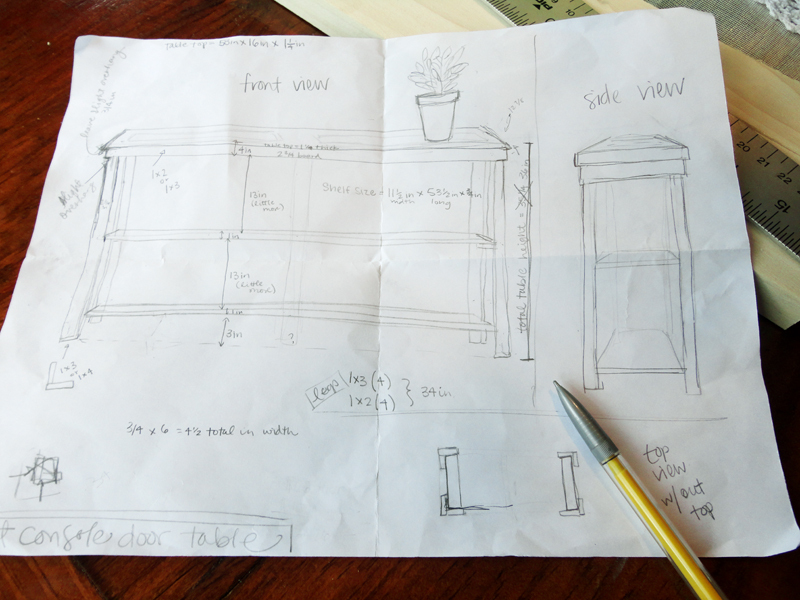 I sketched this out, Drew and I talked about different ways we could construct it, then we measured our foyer windows to see how tall we wanted it, came up with some measurements and decided how much wood we would need and then we set off for the hardware store. 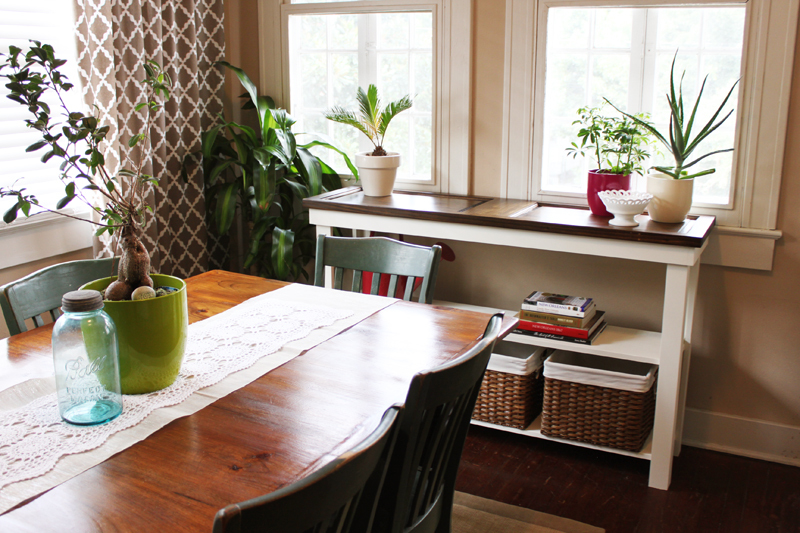 For determining the size & measurements of your table: First off, find your top. 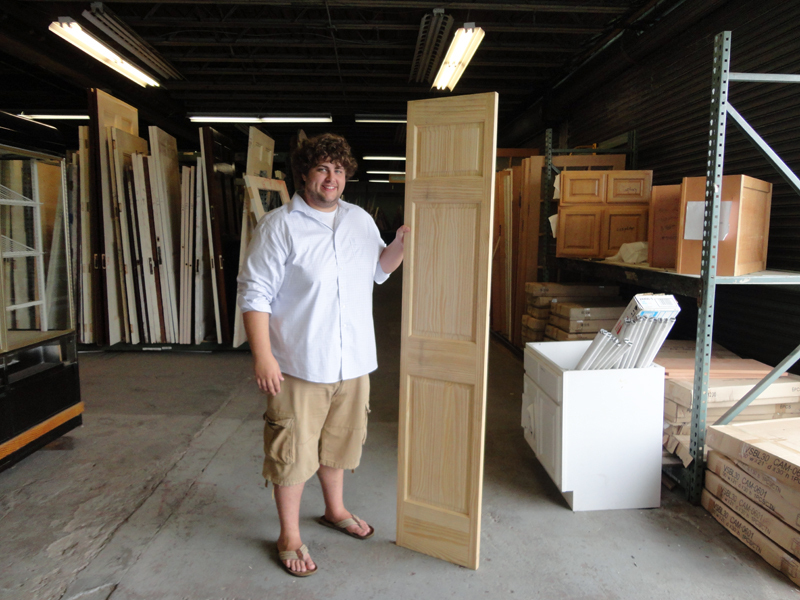 If you can’t find an old door that fits the size you want, you can also buy a different kind of wood and rip it to fit your desired measurements. Whatever you end up deciding to use, cut it to whatever size you want it to be. Then decide how tall you want your table to be. Make sure to subtract the thickness of the top of the table from whatever your desired height is and that is how long you should cut all the boards to make your legs. Also remember when deciding on measurements for your base that for the table to look nice, you want the top of the table to overhang the base by a little bit. I chose to have mine overhang 3/4 of an inch on each side. Here is our door, ready to be cut. 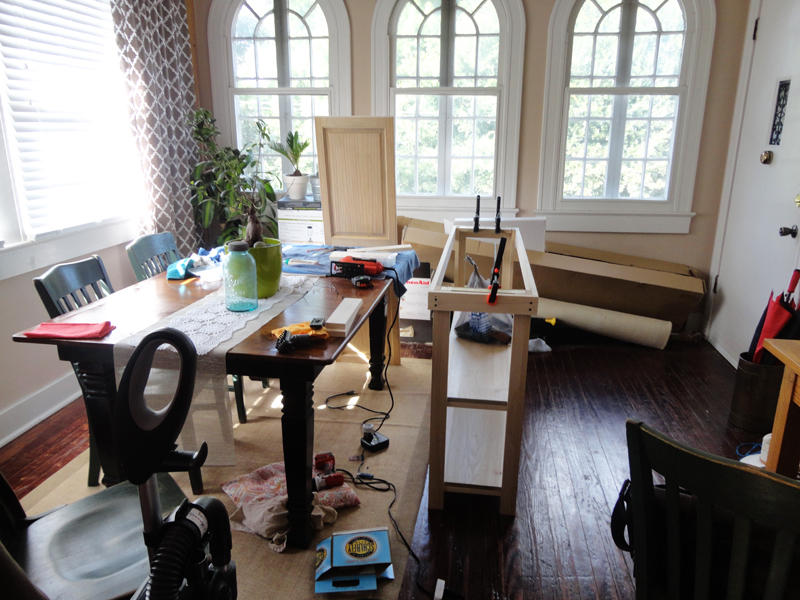 We used our dining room table, lined with towels and clamps to keep it from moving while being cut. 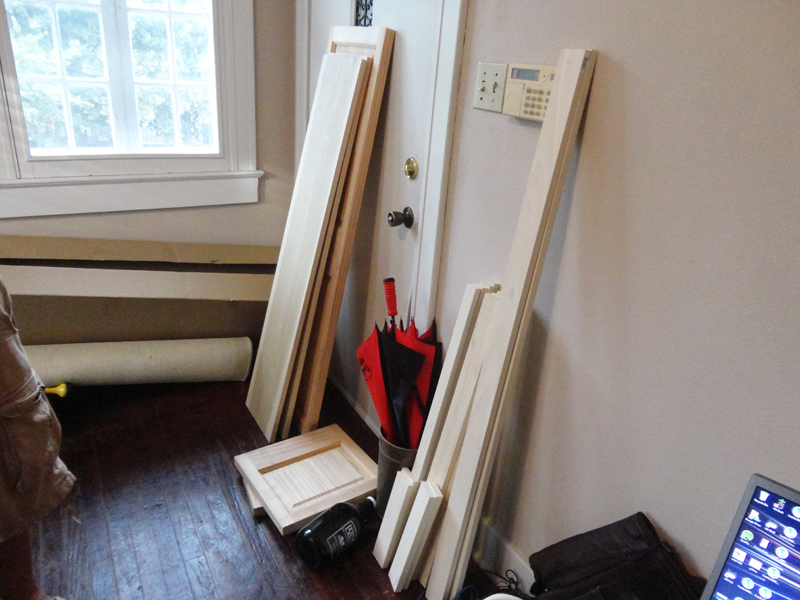 As you can see, the door we bought had a longer space at the bottom and a small little inset area at the top. 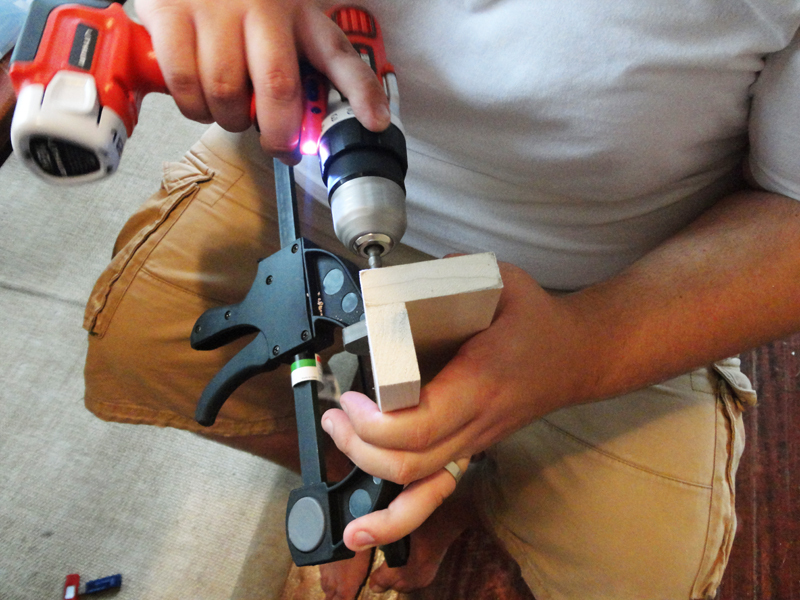 Since I wanted the top of our table to be symmetrical, I cut those parts off. That alone determined the 58 inch length of our table top. Here you can see my cut line all marked. I used a t-square ruler to make sure that all my lines were straight and the angles correct. Another cut on the other side and we have a lovely top for our table! Then, of course, we had a million other cuts to make before we ended up with all our boards ready for assembly! Just a quick note on types of wood to use. So the basic grade pine (regular 2×4 stuff) I’ve found to be a pain to work with a lot of times. It is a harder wood, but it is generally really knotty (which sometimes makes it hard to cut/screw) and it tends to be really bowed and mis-shapen. It is impossible to find nice, straight-ish boards to build something out of. For this project, we upgraded (which cost a little more) to poplar boards. 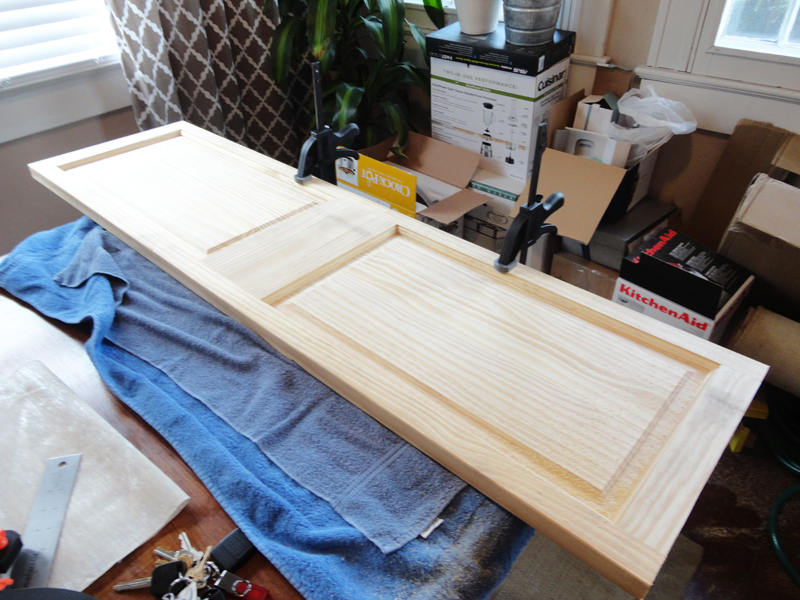 They are a bit softer of a wood, but they are much easier to work with, are much easier to find boards that aren’t so crooked, and I think they lead to a nicer, finished product. 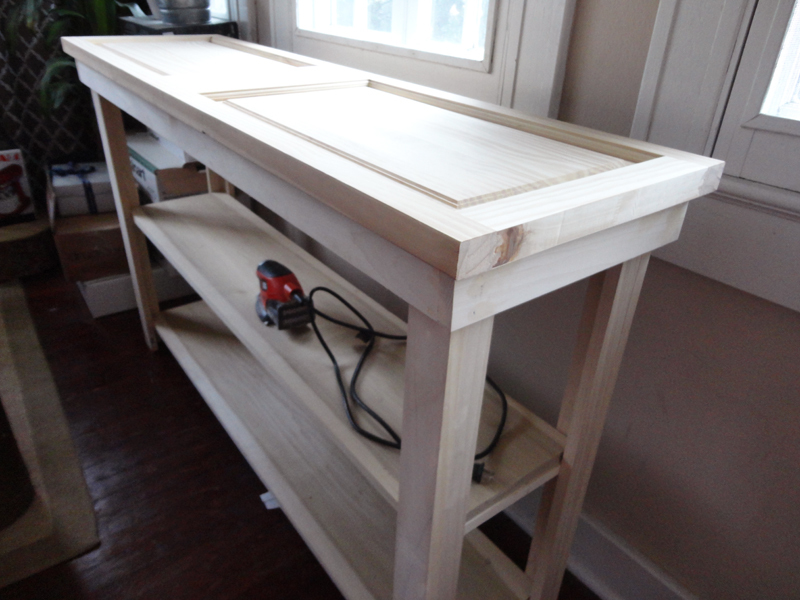 For this table, since it isn’t holding a ton of weight, poplar is fine. If you really want a top-of-the-line, as sturdy as possible table, then go for oak boards (since they are nicer boards and also a harder wood). Just be aware that you will be paying quite a bit more for oak. Drew started by making the legs. 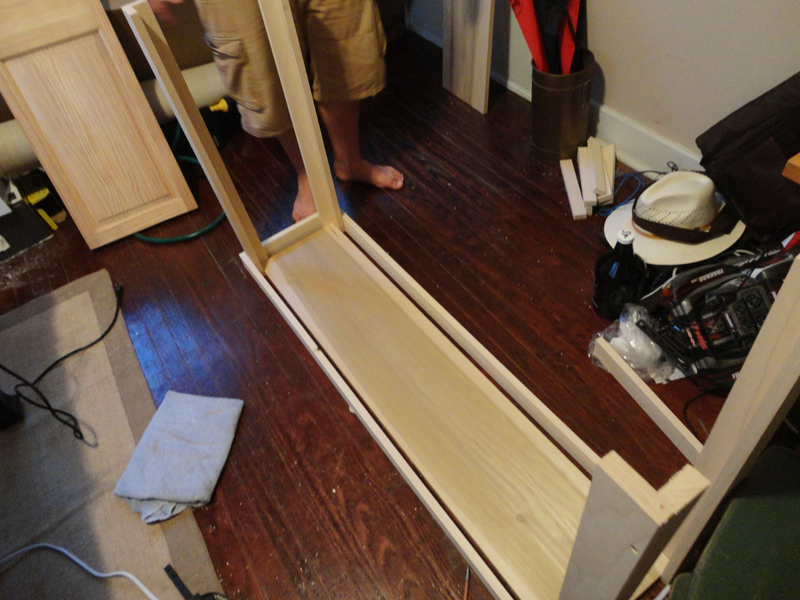 To end up with wide v-shaped legs like these, we attached a (1×2) and a (1×3) together at a right angle. Drew clamped them together to get them all lined up and then just put in several screws all down the length. Do this with all 4 legs. Make sure to be consistent and keep the (1×3) for the front of each leg and the (1×2) for the side of the leg. 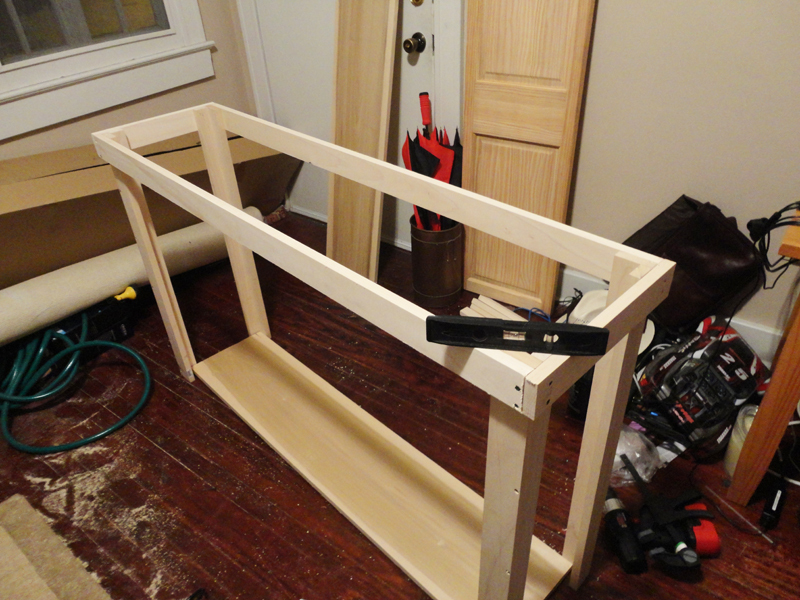 After all four legs are made, next comes time to attach the legs to the top runner/support beams. To make sure we had our measurements all correct, we laid one of our shelves on the ground and build this part around it. That way we knew for sure that everything was the correct distance apart to fit our shelves. 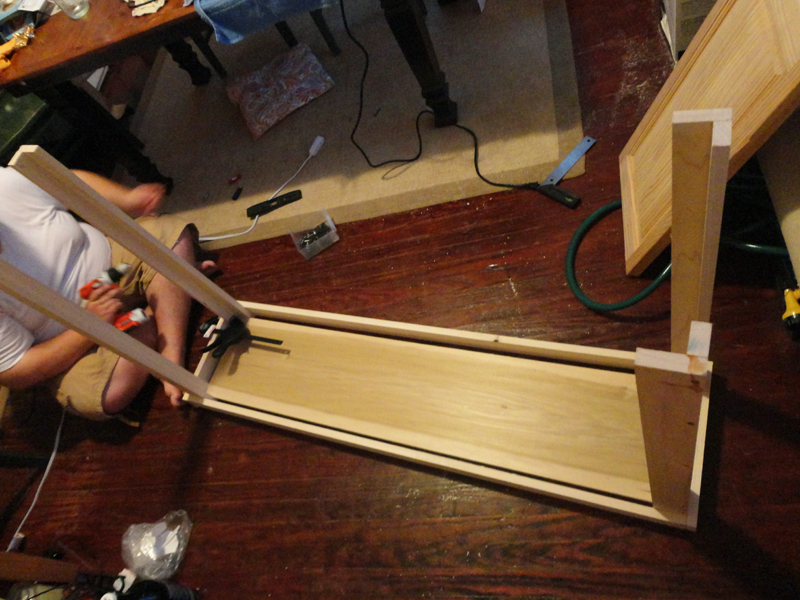 As you can see above, the legs just get screwed into the runner/support beams. 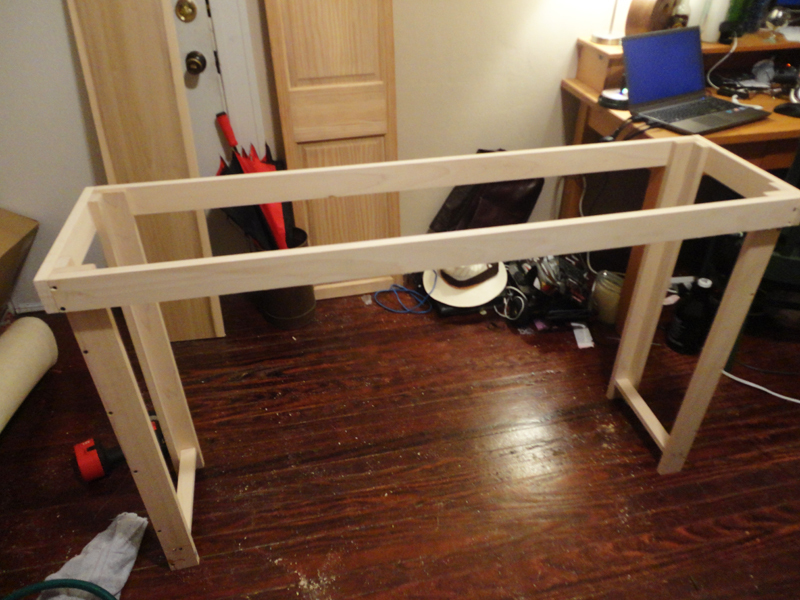 The same with the runner/support beams on the short sides. Here is where we made a mistake with our cuts (and I put what the actual measurements should have been in the list of measurements above). I wasn’t thinking and I forgot when we cut the longer runner/support beams that they should overhang the legs on each side to allow the end/short side support beams to fit inside the overhang. It wasn’t a big deal and we just cut the shorter ones to overhang and line up with the front supports, but I think the finished product would have looked a little nicer if the front runner/support beam was seamless instead of having the seam where the side runners met it. Once we got all those attached, we were getting excited that it was actually starting to resemble something! Then we flipped it over, right side up. We still kept the shelf board sitting on the ground in the middle to make sure everything was the correct distance apart. 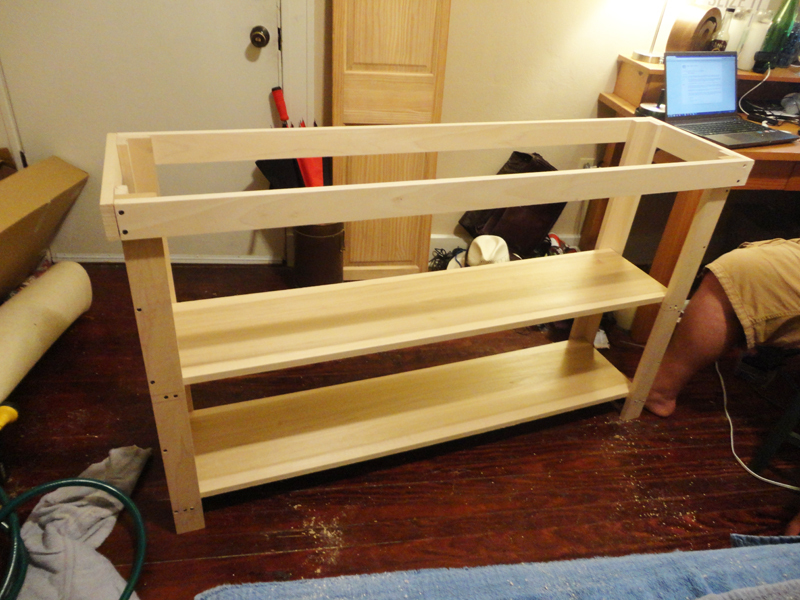 Keep in mind that shelf isn’t attached to anything yet. Next came time for the shelf supports. This part is totally up to you to determine where you want these to go and how far apart you want your shelves to be. For the height of my table, I had the bottom shelf be 3 1/2 inches off the ground and I allowed 13 1/4 inches between each shelf. Keep in mind when attaching these shelf supports that the actual shelf will sit on these, so when determining your measurements and making your marks, you want this support to be underneath the measurement for where you want the shelf to be. For example, I wanted the bottom shelf to be 3 1/2 inches off the ground, so I made my mark for 3 1/2 inches up, then another for 3/4 inch down from that (the width of my board) and those are the guidelines I used for where the support should go. Also make sure that you use a level when attaching these! You don’t want these to be crooked. 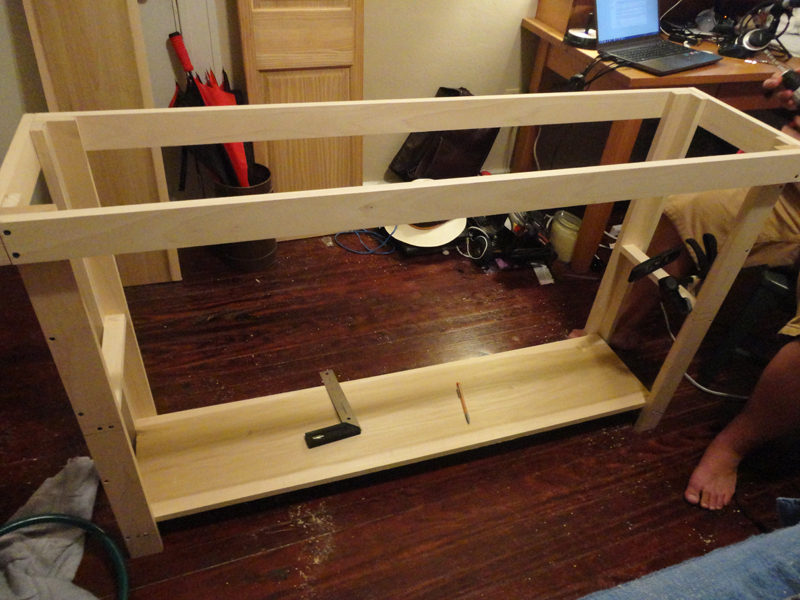 Working on second shelf supports! 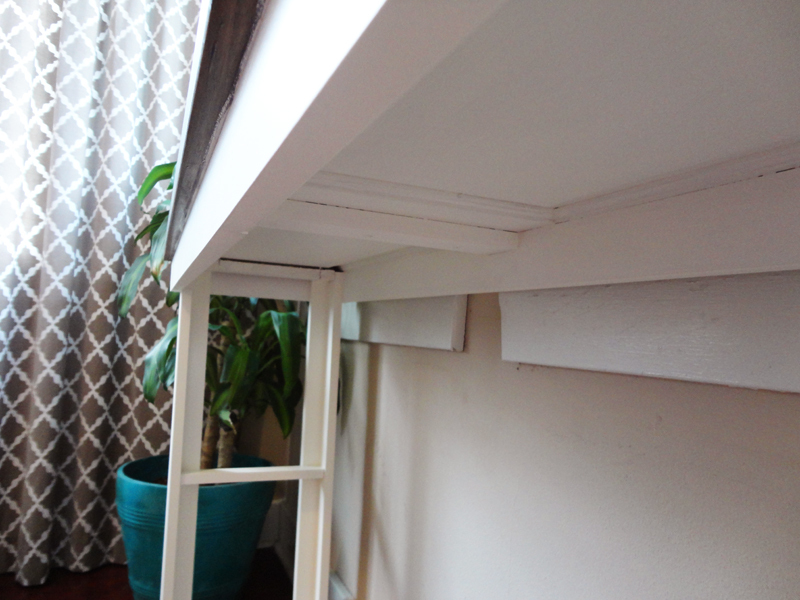 Keep in mind that since our shelves were 11 1/4 inches wide and we had a 13 1/4 inch gap between each shelf, we could easily turn the shelves on their side and slide them in through the side opening to put them in place. If you build a shorter table with less space in between each shelf, you might have to add each shelf in before placing the other shelf supports on or you won’t have any way to get your shelves in! Shelves all in! We didn’t actually screw the shelves themselves in, because I thought it would be easier to paint them if they weren’t attached and I could remove them and paint them separately. Even after I painted them, we still didn’t screw them in. They fit really snug and are weighed down by anything sitting on the shelves, so there really isn’t any reason to have to attach them. If you are worried about it though, you can easily screw them in from below through the shelf supports (just make sure that your screws are the right length and aren’t going to go through to the top side of the shelf). The base here is pretty much complete. We had to stop there for the night, since we live in an apartment and didn’t want to wake the neighbors by making too much noise late at night. The next day we finished up the last little bit. 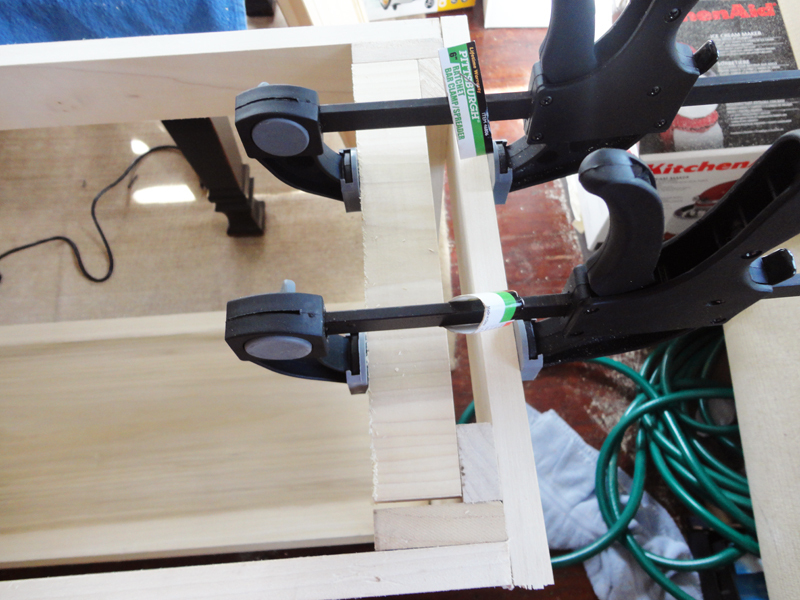 Here is one of the top supports clamped in place. Drew actually had to go get longer screws to be able to screw these into place. In the measurements list above, I said to use (1×2’s) for these. 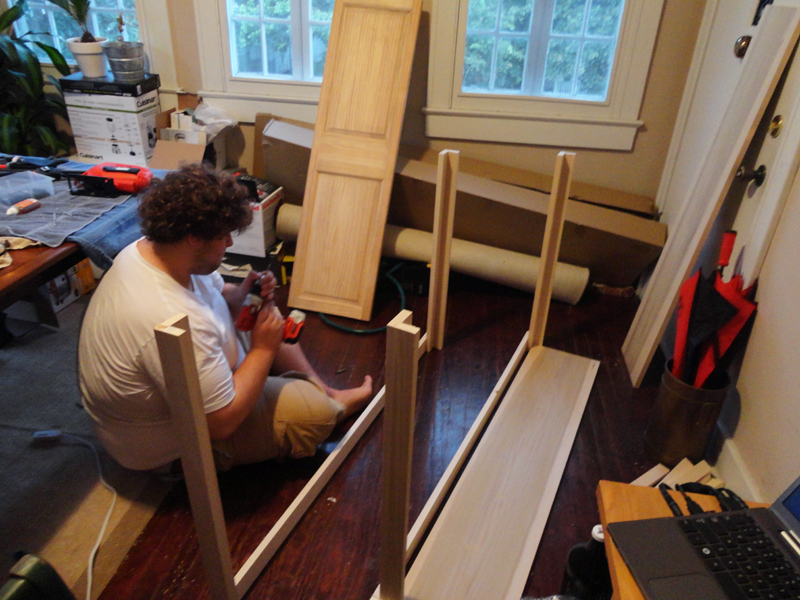 You can do that, or we actually ended up using two small pieces that we cut off the end of our shelves to make them the right length. Since they were already the width of the shelves, they were already the perfect size. Eek! You can see how much of a mess our foyer was during this whole process! I highly recommend completing this project in a garage, carport, outside, etc. Pretty much anywhere other than in your house. The entire room was covered in a thick layer of dust from all the cutting and sanding that took place to make this table happen. 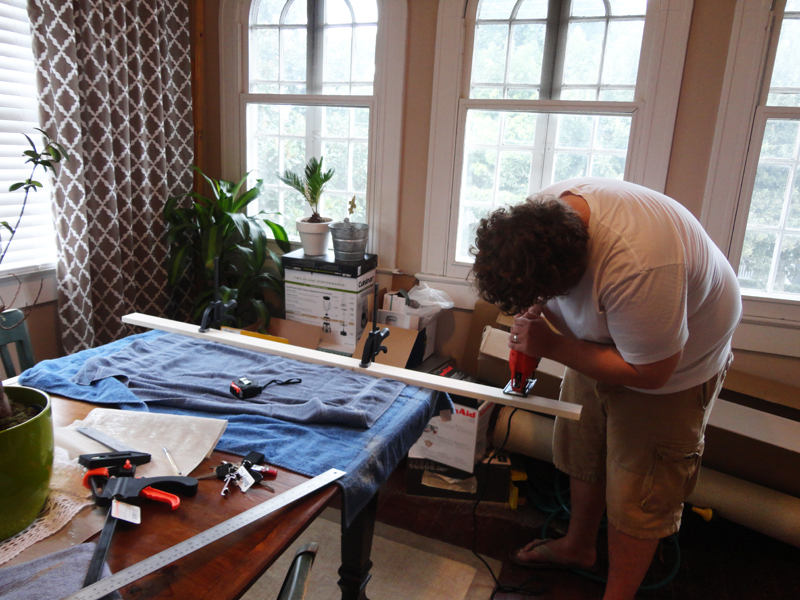 Once Drew got longer screws, he screwed in those top supports and then attached the top to them from below. 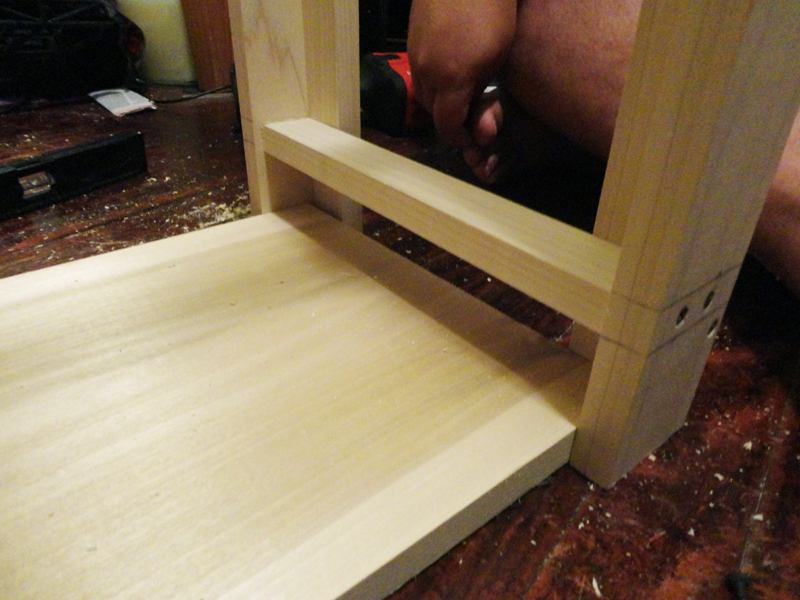 He also included one extra (1×3) support underneath the middle of the top of the table and attached it there too. Sorry that I don’t have pictures of that. He actually finished that part while I was out of town visiting family for a couple weeks. As you can see from this picture above, he also started puttying in the holes and sanding them down smooth while I was gone. Starting to look good! Even in this picture, before paint or anything, you can’t even tell where the screw holes were after they are puttied and sanded! Once I was back in town, I gave it a little more putty, sanded a little more and then gave it a good cleaning. 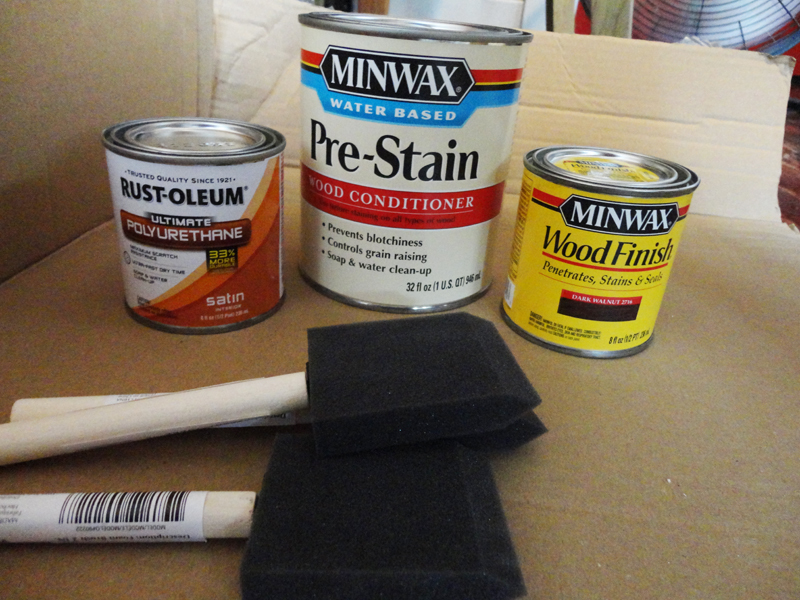 Make sure you have every bit of dust off before you start painting/staining. Also make sure that you lightly sand down the entire table, even parts that you didn’t have to putty, before starting to paint or stain. Lightly sanding takes off any rough edges, wood bits sticking out, etc. and really helps to lead to a smooth finish in the end. I decided to paint the base of the table, since all the putty holes wouldn’t have taken stain as well and would have stood out. But since the top of the table had all been attached from below and didn’t have any puttied holes, I decided to bring out the pretty wood tones with some dark stain. 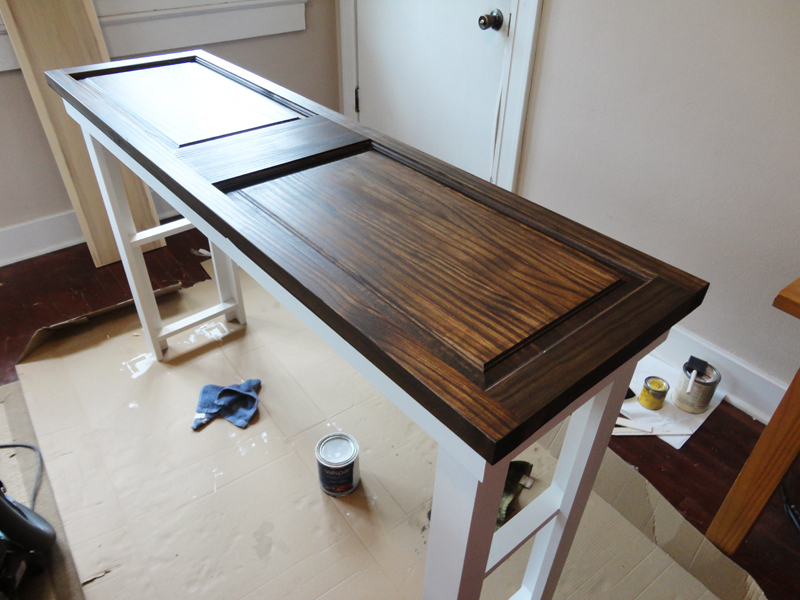 Here are the products that I used– Pre-stain wood conditioner, Dark Walnut stain, and a water-based satin finish polyurethane. I find it easiest to apply all these products with simple, cheap, foam brushes (make sure you use a different brush for each product!). 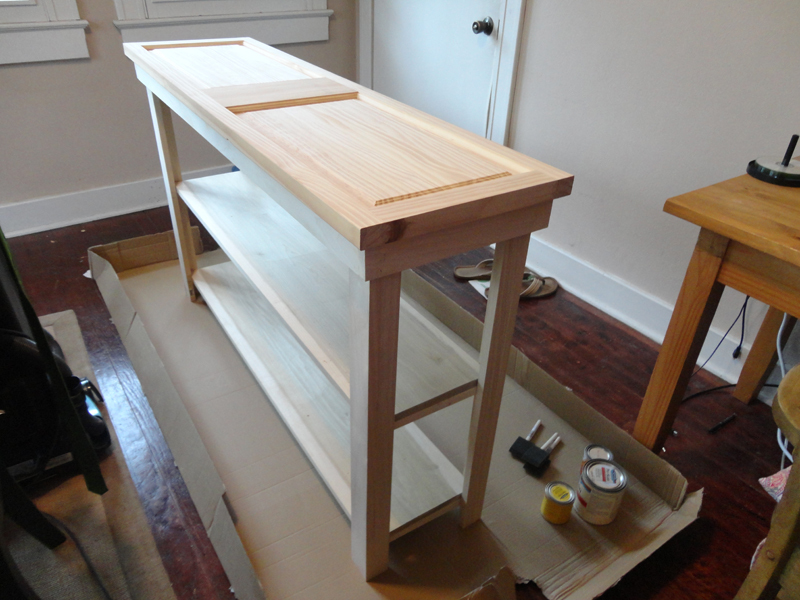 One coat of pre-stain wood conditioner, dry time, and one coat of stain later — we are getting somewhere! Here she is after two coats of stain! 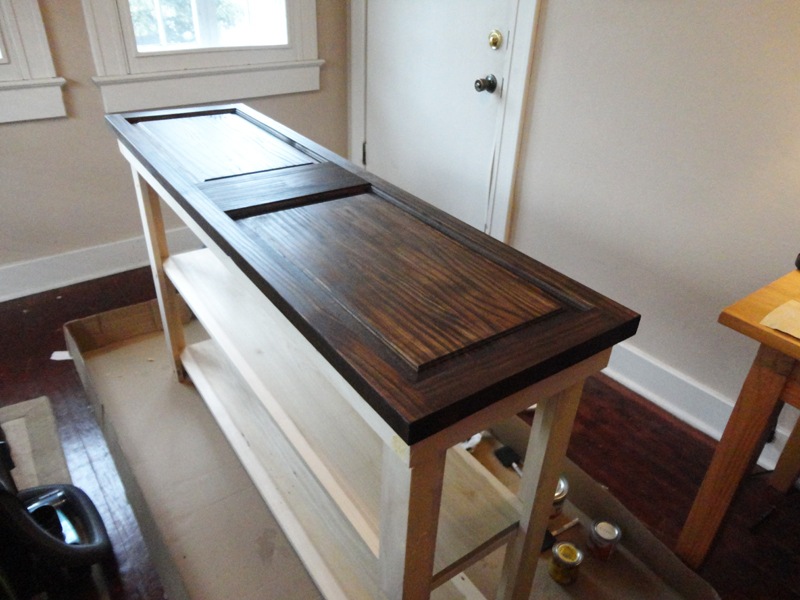 After applying 1 coat wood conditioner, 2 coats of stain, I applied 3 coats of polyurethane. Follow all the directions on your products and do it how they say, making sure to leave the correct amount of dry time in between each coat. You can see, I also started my first coat of paint on the base here. I went with the same color as I used on our refinished headboard — Valspar (from Lowe’s) paint and primer in one in “Wedding Bells.” I think it is a really pretty soft, creamy white color. 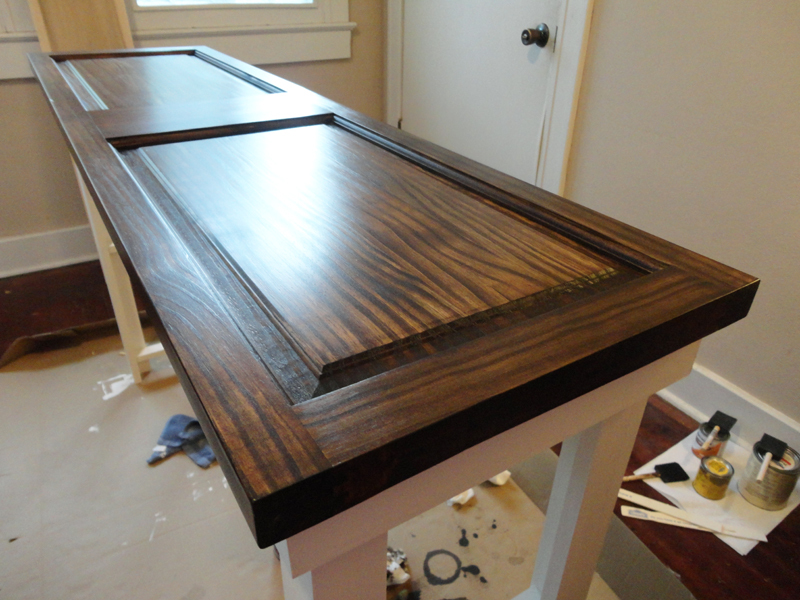 You can see in the picture above how pretty the polyurethane made the finish on the top. I’m so happy I went with the satin finish. Personally, I think it is the perfect finish. Not as dull as a matte finish, but not as overly shiny as a gloss finish. When painting the base — make sure that you lightly sand the whole thing down after your first coat of paint dries. I cannot stress this step enough. It really is essential to having a nice, smooth finished product. When applying the first coat of paint, little wood hairs get stuck in the paint and you can run your fingers over it and feel — it will have a grainy texture. You don’t want that. 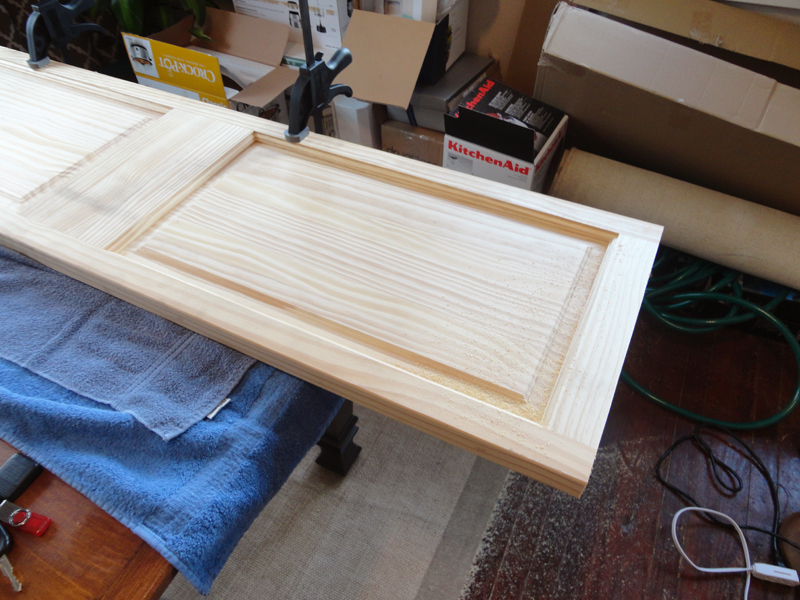 After it dries, lightly sand it all with 220 grit sandpaper until it is smooth to the touch. It will look so much better in the end. Starting to look good! After sanding down your first coat, clean the whole thing with a wet rag to remove any dust then add your second coat of paint. 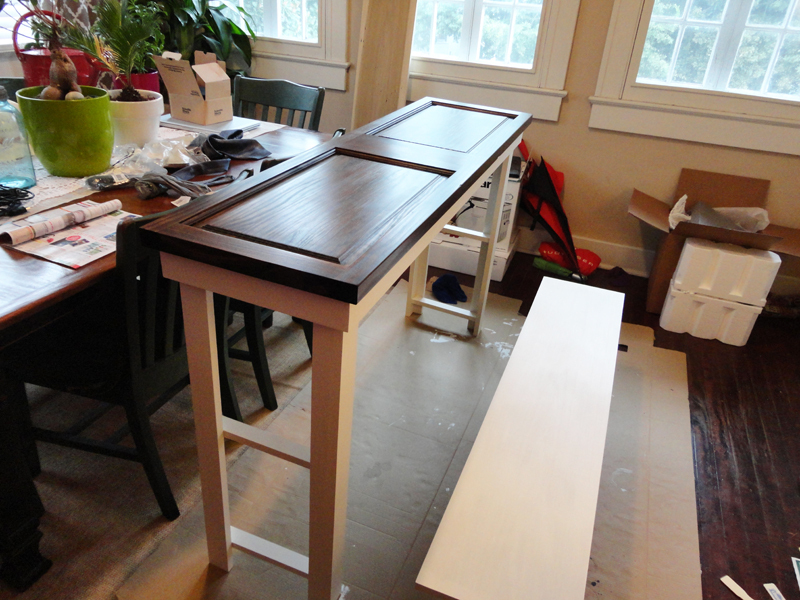 Since my paint was paint & primer in one, it covered well, so I only did two coats total. Depending on the paint, you might need a third coat. Same with the shelves. 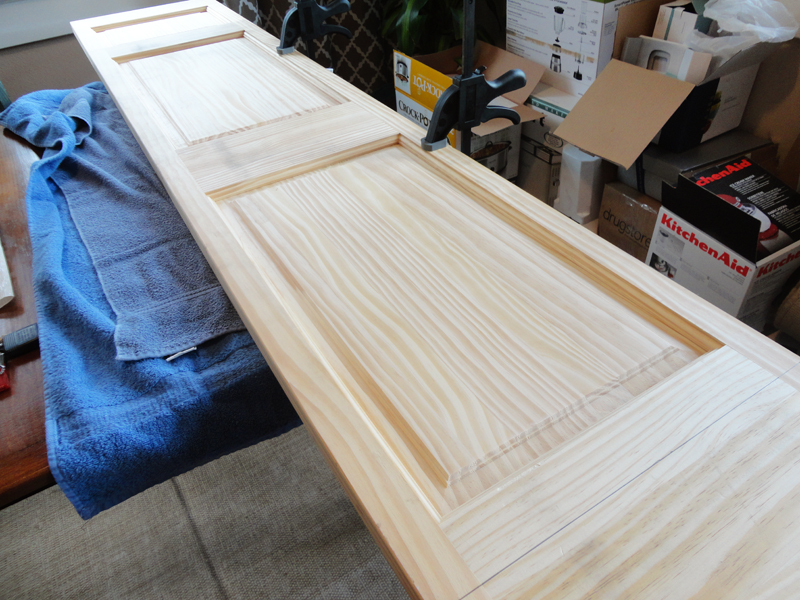 Make sure to also sand those after the first coat as well. Since I didn’t show it above during the building process, in the photo above you can better see the underneath top supports. After all the painting, sanding, staining and sealing (that took much longer than implied by this post) I put my shelves back in, let all the paint cure for a few days (my polyurethane recommended that I let the top cure for 7 days before use), then got to work incorporating this piece into our home. Ready to see more of the final pictures?! I love the way it looks in our house! It fits our style perfectly and is so meaningful since we designed and built it ourselves. It will definitely be a piece we treasure forever. I love how functional it is as well! It works so great for several of our plants that need lots of light, it is great for storage for Drew’s electronic/office equipment (in the baskets from Target) and the whole shelf above is great for open storage as well. 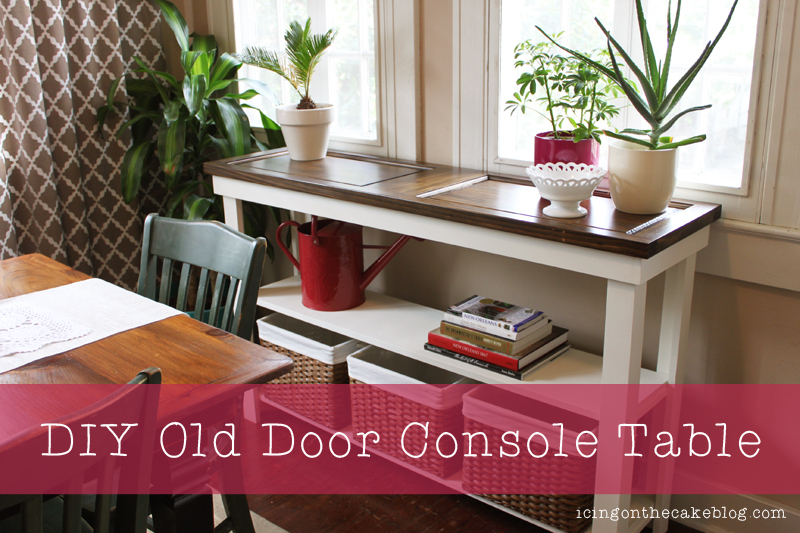 I love that it also helps to define this room as an entryway of sorts. The little milk glass container on the top of the table I got for a few dollars at a thrift store and it works great for holding Drew’s keys, business card holder, etc that he takes out of his pockets when he gets home. I love that they have a place now instead of getting lost all over the house. 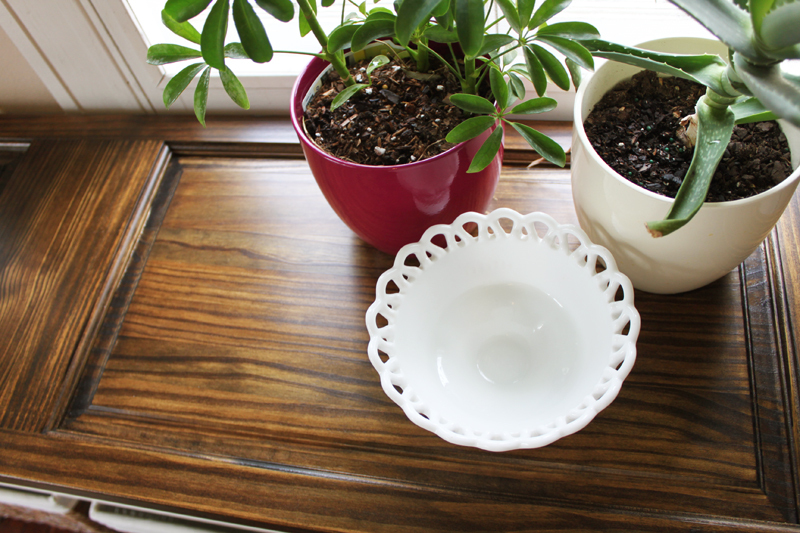 You can also see in these pictures how the soft white base of the table is more of a creamy white than a bright white (in comparison to the milk glass container). 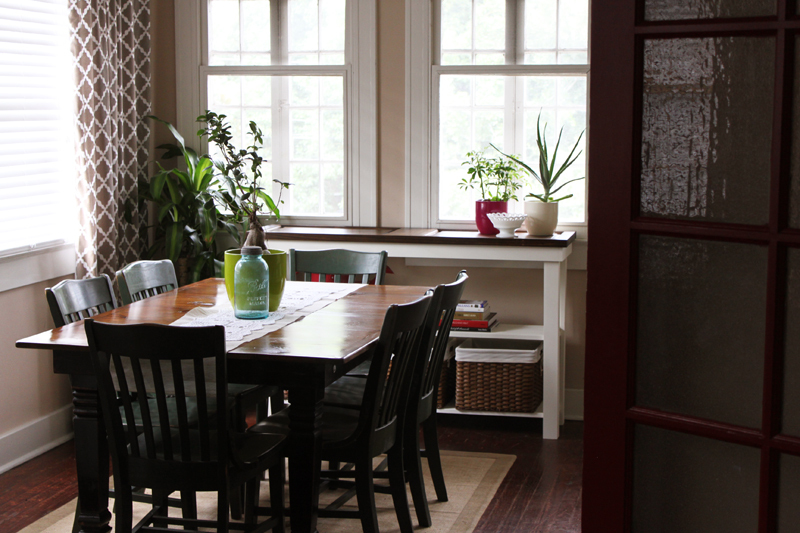 I’m also thrilled with the fact that my foyer is clean and pretty again! 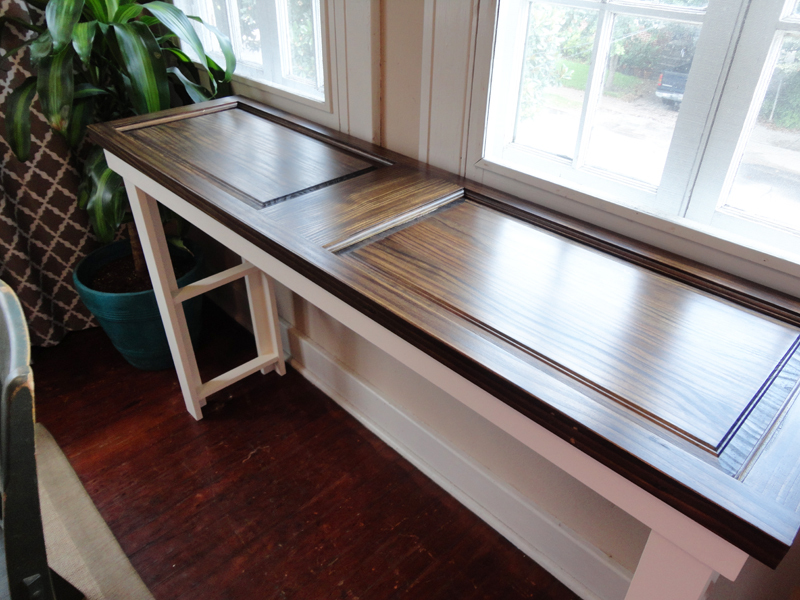 I love the finished product of this table, but I’m so happy to be done with it! I hate when the whole house is a wreck while projects are being done! We can actually eat dinner in here again! I love that it is visible from the living room as well! Not the cheapest project we’ve ever done, but one of our favorites for sure. Probably the most work of any project so far. 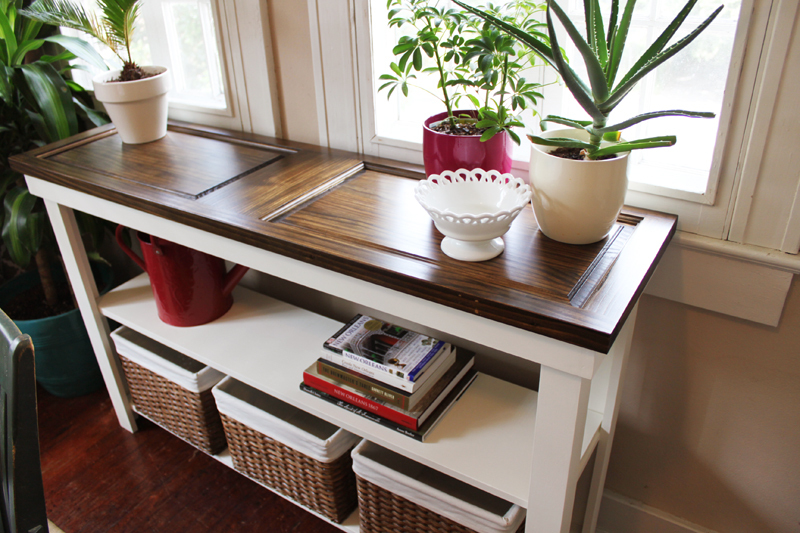 Similar console tables from other stores can be several hundred dollars more, so I’m pretty pleased with ours. Looking like you guys are needing an art studio! !